28/06/2007 — Acquisition — Paris, Musée du Quai Branly — Although devoted to Primitive Art, the Musée du Quai Branly also owns Western works chosen for their ethnographic iconography some of which had been displayed recently in the exhibit “D’un regard l’autre”. It is for this department that the museum pre-empted a painting by François-Auguste Biard in a sale at Christie’s Paris on Wednesday, June 20, for the sum of 57,600 euros. After an expedition to Lapland and Spitzbergen in 1839, Biard returned with particularly impressive scenes which stand out in French painting of the period, not only for the content but also for the treatment of the subject (Magdalena Bay Louvre or Hunting for Walrus Dieppe, castle-museum). The Romantic spirit with which he represents nature’s grandeur and man’s solitude against the elements evokes, by pure coincidence, the German and Nordic painters, such as Friedrich and Dahl. In 1860 Biard spent two years in Brazil where he founded a Fine Arts Academy. His trips through the Amazon jungle inspired a work illustrated with engravings from his sketches : Deux ans dans la forêt brésilienne (Two years in the Brazilian forest) as well as paintings such as the one just acquired by the Parisian museum. 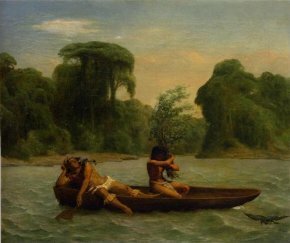 The work represents two Indians in a canoe. The woman holding a bunch of branches seems to act as a sail whereas the man, in a less tiring role, is simply guiding the boat. An exact contemporary of Delacroix, Biard is obviously thinking here of his painting The Natchez (New York, Metropolitan Museum) produced thirty years earlier.